This post is for everyone whose Toshiba 37AV500U powers on without picture. I apologize for not posting accurately guiding pictures, but at the time I was just fixing the TV, not planning to write about it. A while a go I got a Toshiba 37AV500U LCD TV broght in store for repair. The problem was it powered on without a picture and I was quickly able to narrow it down to one of the backlight inverters. Do not remember if it was the master HIU-811-M or the slave HIU-811-S. Turned out there was only one place where I could buy one and it was like $160 - an insane amount at a time when a practically new 37'' can be found on Craigslist for about $350. While searching , though, I realized that a completely different inverter was listed for the same Toshiba TV model. 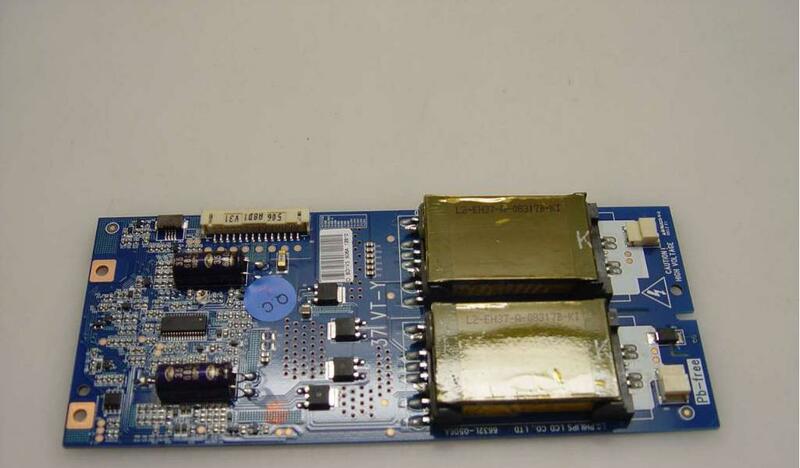 It was the LG Philips board 6632L-0506A / 37VT-Y / PPW-EE37TV-0 . It is not unusual for manufacturers to switch parts within particular model, usually due to supply problems. So I figured chances are the above said inverter may be used as a substitute. I took the leap and ordered one for $80 as opposed to paying $160 for the original HIU-811 board. The 37VT-Y board replaces BOTH HIU-811-M boards as it has TWO lamp outputs. I mounted the board on the place of the left HIU inverter looking from the back. I did so because with a little stretch I was able to directly plug the left cable for the backlights directly into the board. So the problem was with the wire for the lamps powered with the HIU inverter on the right side. I had to cut and extend the original right sided cable , passing the extension under the LCD (where typically the speaker cables go) and attach it to the second output of the 37VT-Y board. Here, hope this helps...the TV worked like a charm and not only I paid less for inverter, but I was able to sell the working HIU inverter for about $40 or $50 as well, ending up with a nicely working solution for about $30! Hope you can do too!